A lone car sits in the ditch of Hardin-Wapakoneta Road near its intersection with Greenville Road, just south of Hardin. Upon arrival, Shelby County Sheriff’s Deputies found the vehicle, owned by Heather Lee Hendrickson, of 3856 Hardin-Wapakoneta Road, with front end damage and a smashed windshield. The driver, Hendrickson, had left the scene. The Lockington Fire Department and Houston Rescue also responded. The crash occurred around 6:10 p.m., Sunday, April 7. -8:36 a.m.: investigate complaint. Deputies investigated a parking complaint at 380 Black Foot Trail, in Washington Township. -7:51 a.m.: investigate complaint. Deputies investigated a complaint at 10389 Black Fox Trail, in Washington Township. -8:09 p.m.: investigate complaint. Deputies responded to 3403 Chickasaw Court, in Washington Township, to investigate a noise complaint. -5:23 p.m.: investigate complaint. Deputies investigated a complaint at 13901 Tawawa-Maplewood Road, in Jackson Township. -5:02 p.m.: hit-skip accident. Deputies investigated a report of a truck with unsecured load dropping stones on a nearby vehicle. -4:15 p.m.: burglary. Deputies responded to 5880 State Route 29, in Perry Township, on the report of the left of plywood, past occurred. -3 p.m.: investigate complaint. Deputies investigated a complaint at 320 E. North St., in Clinton Township. -11:58 a.m.: trespassing. Deputies responded to 200 Bulle Road, in Orange Township, on the report of trespassing. –11:19 a.m.: investigate complaint. Deputies investigated a complaint at 332 N. West Ave., in Clinton Township. –8:08 a.m.: investigate complaint. Deputies investigated a noise complaint at 107 W. Walnut St.
–2 a.m.: investigate complaint. Deputies investigated a complaint in the 300-block of East Main Street, in Salem Township. –6:16 p.m.: suicide or suicide threat. Deputies responded to 225 E. Court St., in Clinton Township, to investigate the report of a suicide threat. -11:42 a.m.: sign/signal problems. Deputies responded to a downed stop sign at Scott and Sharp crossroads, in Franklin Township. -9:09 p.m.: fireworks. Deputies responded to the 3000-block of West Mason Road, in Franklin Township, on the report of fireworks being set off. -9:02 p.m.: reckless operation. Deputies responded to the 10000-block of Seminole Trail, in Washington Township, on the report of reckless operation of a four-wheeler. -8:22 p.m.: investigate complaint. Deputies investigated a complaint at the Sheriff’s Office, 555 Gearhart Road, in Clinton Township. Heather Lee Hendrickson, 48, 3856 Hardin-Wapakoneta Road, was cited with failure to control following a one-vehicle crash on Sunday, April 7, at 6:10 p.m.
Hendrickson was traveling southbound on Hardin-Wapakoneta Road when she went off the left side of the roadway, striking a T-intersection sign. She then continued south, striking a driveway. Hendrickson’s vehicle went airborne and landed on the opposite side of the driveway, where it came to a final rest. Upon their arrival, Sheriff’s Deputies found the vehicle vacant, as Hendrickson had left the scene. She was later found and questioned, stating she was attempting to reach for her cell phone when she went off the left side of the roadway. • Clifton L. Hammons, 30, of Piqua, was cited with failure to control following a one-vehicle crash on Wednesday, April 3, at 10:26 a.m.
Hammons was traveling northbound on state Route 66, when he swerved to avoid debris in the roadway, causing him to go off the right side of the road slightly. Hammons over-corrected, causing him to cross the center line. He then ran the vehicle off the west side of the road, striking a power pole, causing damage to the pole. The vehicle continued back onto the roadway, crossing the center line a second time, and again ran off the road into a yard on the east side of state Route 66. -9:13 a.m.: investigate complaint. Botkins Police responded to 205 Mary St., in Dinsmore Township, to investigate a parking complaint. –12:01 a.m.: loud music. Jackson Center Police responded to 100 Village Parkway, in Jackson Township, on the report of a loud party/music. -11:35 a.m.: investigate complaint. Jackson Center Police investigated a complaint at 115 E. Pike St., in Jackson Township. -12:18 p.m.: medical. Fort Loramie Rescue and Fort Loramie Police responded to the 12000-block of Brun Drive, in McLean Township. -11:24 a.m.: medical. Anna Rescue and Anna Police responded to the 600-block of East Main Street. -11:01 a.m.: medical. Russia Fire Department, Houston Rescue, and Versailles Life Squad responded to the 200-block of West Main Street, in Loramie Township. -12:10 a.m.: medical. Anna Rescue and Perry Port Salem Rescue responded to the 200-block of Sapphire Court, in Franklin Township. -11:44 p.m.: medical. Anna Rescue, Deputies, and Sidney Fire Department responded to the 3000-block of County Road 25A, in Franklin Township. -10:07 p.m.: medical. Anna Rescue responded to the 3000-block of Sidney-Freyburg Road, in Franklin Township. -8:28 p.m.: medical. Russia Fire Department and Versailles Life Squad responded to the 200-block of Elizabeth Street, in Loramie Township. –2:09 p.m.: medical. Anna Rescue responded to the 3000-block of Sidney-Freyburg Road, in Franklin Township. –4:43 a.m.: medical. Anna Rescue responded to the 3000-block of Sidney-Freyburg Road, in Franklin Township. –3:02 a.m.: medical. Houston Rescue, Sidney Medic, and Sidney Fire Department responded to the 5000-block of Hardin-Wapakoneta Road, in Turtle Creek Township. –12:51 a.m.: medical. Anna Rescue, Sidney Medic, and Sidney Fire Department responded to the 3000-block of Sidney-Freyburg Road, in Franklin Township. –5:35 p.m.: medical. Perry Port Salem Rescue responded to the 18000-block of McCloskey School Road, in Green Township. -1:49 p.m.: medical. Anna Rescue and Wapakoneta Fire Department responded to the 200-block of Elic Court, in Dinsmore Township. -1:22 p.m.: medical. Anna Rescue and Jackson Center Police responded to the 100-block of Redbud Circle, in Jackson Township. -11:39 a.m.: vehicle fire. Anna Fire Department responded to the 600-block of North Pike Street, in Dinsmore Township. -11:27 a.m.: medical. Anna Rescue and Van Buren Fire Department responded to the 8000-block of Lock Two Road, in Van Buren Township. -7:02 a.m.: medical. Russia Fire Department and Versailles Life Squad responded to the 1000-block of Rangeline Road, in Loramie Township. -4:43 a.m.: medical. Anna Rescue responded to the 3000-block of Sidney-Freyburg Road, in Franklin Township. -3:30 a.m.: fire. Botkins Fire Department responded near mile marker 100, on Interstate 75, in Dinsmore Township. -2:13 a.m.: medical. Fort Loramie Rescue and Deputies responded to the neighborhood block of Louie Street, in McLean Township. -9:19 p.m.: medical. Anna Rescue and Anna Police responded to the 200-block of North Third Street, in Dinsmore Township. 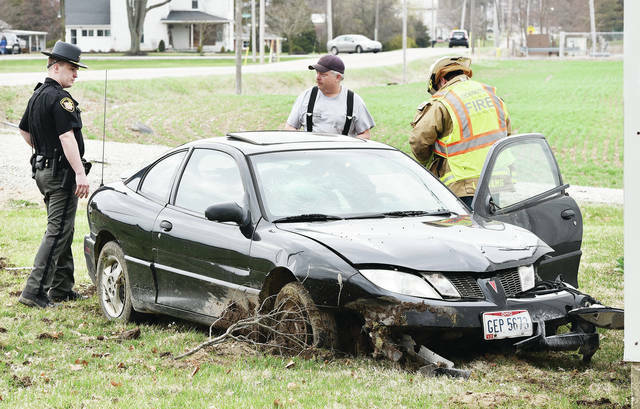 https://www.sidneydailynews.com/wp-content/uploads/sites/47/2019/04/web1_SDN040919Crash-3.jpgA lone car sits in the ditch of Hardin-Wapakoneta Road near its intersection with Greenville Road, just south of Hardin. Upon arrival, Shelby County Sheriff’s Deputies found the vehicle, owned by Heather Lee Hendrickson, of 3856 Hardin-Wapakoneta Road, with front end damage and a smashed windshield. The driver, Hendrickson, had left the scene. The Lockington Fire Department and Houston Rescue also responded. The crash occurred around 6:10 p.m., Sunday, April 7.